We will keep you in stitches! 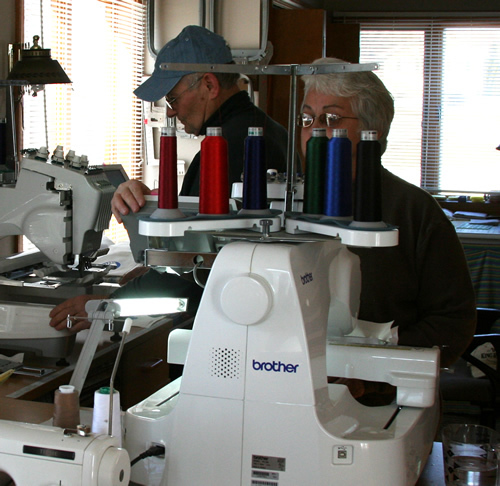 King's Treasures has been making machine embroidery for quilters since 2004. We had our beginning in the quilting craft show markets and decided after a few years to start focusing on making products that would aid quilters in creating their own masterpieces. Currently we do Quilting shows in the eastern half of the United States from Florida to Maine. Our most western show is in Paducah, KY. We'd love to see you at a show. Please check out the schedule here. All of our products are created with the utmost of care with you the quilter in mind. We make quilts and use our products. We hope that you enjoy them and welcome any feedback or any product wish list that you have. In our beginnings the business was started with 2 sisters, Linda and Nancy. Most recently upon retirement, Linda's husband Brian has been added to the "staff" of our little company that works mainly out of our home in Lisbon, Maine. Nancy Murtie is the pattern designer and teaches at many of the shows. She recently became a certified Eleanor Burns instructor. We've had a web store for a while but it was never quite up to date. With the help of Brian we will be keeping the site better stocked and will be running sales. You can sign up for a newsletter on the bottom-left hand side of the webpage. We look forward to serving your quilting needs.